Though certainly well traveled, Brandy never been much of a polyglot. "At times I can barely handle English, so I've no business trying to communicate in Latin or German," she says. Of course a few well learned phrases have kept her out of trouble over the years, but a true understanding of foreign languages has always eluded her. But what with the various polar vortices this winter keeping us all in doors, Brandy has decided to put some of her spare time towards finally mastering another tongue by brushing up on her French. "I feel knowing a bit more French would come in handy should I come across a member of the Canadian Olympic curling team so I can tell them where they can bloody well shuffle their stones!" (Brandy is still rather bitter England did not come home with the gold medal in curling). Thinking some authentic French food might put her in the right sort of mindset for learning the language, Brandy headed for the Lakeview location of La Boulangerie, a traditional French bakery, creperie, and cafe. Located just a few doors down from the Belmont El station, La Boulangerie is a quaint little storefront with a few cafe tables and chairs, a crepe making station, and several cases holding a variety of glisteningly beautiful authentic french pastries, so authentic in fact that the labels for nearly everything were in French. A cheerful girl behind the counter smiled patiently as Brandy tried desperately to remember how to conjugate. "Bonjour," Brandy said, "I, uh... je veux...uh...un...singe." The girl cocked an eyebrow at her quizzically. "I mean, I uh... Je voudrais manger...une...chaussure?" "I'm sorry, mame, I don't speak French, but I can call the chef if you'd like," the girl said. "Oh thank goodness," Brandy sighed, "Nevermind, my dear. Now lets see..." A few minutes later, Brandy was leaving La Boulangerie with a bag full of goodies, and after arriving home and making a quick cup of tea, she dove in head first. First there was the freshly made Egg, Bacon, and Cheese sandwich, which came on a beautifully flaky and buttery croissant. Though delicate, the croissant held together remarkably well, standing up to the thick and crispy bacon, hearty egg, and melty Swiss cheese. Brandy had also ordered a slice of the Bacon and Onion Crustless Quiche, which she quickly warmed up in her oven. Thinking this creation to be a little more in line with a spanish frittata than a fluffy and creamy quiche, Brandy was delighted to find it to be quite airy. The chunks of smokey bacon throughout helped to add some texture, but she especially loved the sweet little pockets of caramelized onions. "It still seems a little more in line with a frittata than a quiche, but I'm not opposed to a little international fusion," Brandy mused. Brandy then moved on to the pastries, of which there were five: a berry tart, a chocolate tart, a chocolate eclair, a cream puff, and the Paris Brest, which was a traditional peaux de choux confection filled with a sweet hazelnut paste. The Salted Caramel Choux, as the cream puff had been labeled, was a definite standout for its soft hit of delicate sea salt in both the glaze on its top and in its decadent cream filling. Also a surprise was the Chocolate Tart, which had a rich layer of ganache on top, a second layer of gooey toffee and peanut bits, and a crisp chocolate cookie like shell. As one final treat, Brandy nibbled on a box of the most beautiful variety of authentic Macarons. Not able to resist these colorful little gems, as they were displayed on individual plates inside one of the cases in the cafe, she had asked the shop girl for a sample of each flavor. Her favorites of the bunch included the yellow Mango, which had a slightly more moist interior than its fellows as well as a brilliant tropical taste, the beige colored Salted Caramel, which carried the same delicate sea salt hit and creamy innards as the cream puff had, and the Champagne, which had a very unique almost floral sweetness to it and a beautiful pink speckled shell. At the bottom of her bag, Brandy noticed a small postcard explaining that La Boulangerie was currently running a Kickstarter campaign in order to re-open a location in Logan Square. Rewards for contributions included two years worth of free baguettes, crepe parties, and private cooking classes. "Seems a win win situation," Brandy thought, "I get free baguettes whenever I want them as well as a second option for where to get them? Oui s'il vous plaît!" Snacking on all of her authentic French treats, Brandy was able to master at least five different ways to tell a Frenchman that his trousers were an ugly color, which she considered a victory for the day. "Perhaps I'll go back to La Boulangerie tomorrow for more collations and teach myself how to ask the way to the nearest discotech and then I'll know all the French I need to know." From the Kitchens of Bunny and Brandy: Wonderful Sweet Scarletts Giveaway! What with the unpredictable winter weather Chicago has been experiencing this year, Brandy has had to take off quite a few weekends from journeying about the city in search of brunch. Never one to take no for an answer, the polar vortex has merely forced Brandy into her own kitchen instead of enjoying the fruits of someone else's. The gloomy snow has started to get to Brandy mood, however, so this week she went in search of something a little more cheerful. "Citrus, that's what I'm craving," she thought as she wandered through the grocery store, "A nice little bite of sunshine would do the trick nicely." Luckily, she then stumbled upon a heaping pile of beautiful grapefruits. These were in fact Sweet Scarletts Texas red grapefruit, a brand new discovery from the makers of Wonderful Pistachios, POM Wonderful and Wonderful Halos mandarins. Taking home a couple of the fruits, Brandy decided on two very simple preparations: one she juiced and one she sprinkled with brown sugar and put under the broiler. Both the juice and the caramelized grapefruit proved to be that little punch of summer Brandy was looking for in the cold and desolate wasteland that is Chicago in February. The Sweet Scarlet Giveaway is now closed! Thanks to Theo A. who won the contest with her Facebook entry: "My favorite, albeit labor intensive, way to eat a grapefruit is to peel like it an orange removing sections of the grapefruit from the peel and the good-for-you skin, so that I just get to shove the grapefruit goodness in my mouth. I usually end up with juice all down my arms and a puddle where I'm sitting, but that all seems totally worth it." Please contact us in the next 24 hours with your mailing address to claim your prize! Thanks so everyone who entered! The giveaway is open now and will run until Midnight CST Tuesday 2/25 with the winner being announced the morning of Wednesday 2/26. 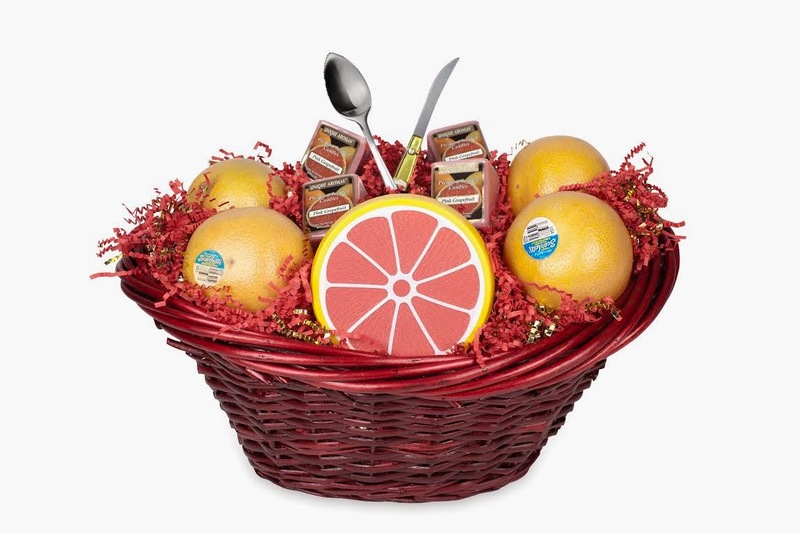 To enter this giveaway, simply tell us your favorite way to eat grapefruit by either leaving a comment on this blog post, leaving a comment on our giveaway post on Facebook, or Tweeting us! Good luck in capturing your own little basket of sunshine! *The writers of this blog were provided samples of Sweet Scarlet red grapefruit for the purposes of this review. Sometimes we all need a little inspiration. Some of us look to the web to become our muses and teachers. Others find inspiration in daily living; the beauty of a rose bush in a front yard or the laughter of children on a playground. Brandy, of course, often finds inspiration in the bottom of a glass, or rather the bottom of a teacup. "I find my tea leaves as inspiring as anything. Why, my old neighbor Mr. Pollack used to come over for tea just so he could study my tea leaves. He said he found their patterns 'organic and chaotic,' whatever that means. But then again, I've never been much of a painter." It was one particularly chilly morning when Brandy's old friend, the genius inventor Brocco Leigh Binto, was lamenting his lack of engineering initiative. "Its so hard to think of anything useful when everything outside is cold, slushy, and grey," he complained, "How am I supposed to better the human race when I have no desire to come out of my lab?" "What you need is a good hot meal," Brandy said, "Getting out among other people will help to lubricate that old noggin of yours. I know the perfect place!" And so Brandy brought Brocco and his lovely lab assistant Brassica to Endgrain, the still fairly new and very innovative neighborhood joint, known for its down to earth style of fine dining. Endgrain was a little small on the inside, and only seemed to grow smaller as it filled up with people. One side of the room was taken up by a massive coffee bar and counter space, while the other housed tables with banquette and chair seating. Brandy and company were escorted to a big table in the corner where they could observe the whole room. The walls housed a variety of questionable looking taxidermied animal heads, which did help to dress up the modern, yet rustic space. Brandy, Brocco, and Brassica ordered up some drinks from the extensive coffee bar to start off with; for Brocco, a creamy, warming chai tea, for Brassica, a rich and smooth hot chocolate, and for Brandy, a dark and deeply flavored mocha. Brandy was very impressed by the quality of the drinks, all of which were extremely pure tasting, not having been watered down or made with inferior quality products like some other well known places do with their extravagant coffee beverages. To start off the meal, Brandy insisted on trying some of Endgrain's infamous donuts. The group decided on the Bacon Butterscotch, the Vanilla Bourbon, the Honey Glazed, and the Salted Caramel. The Bacon Butterscotch proved to be a hit all around with its crisp bacon topping, decadent butterscotch glaze, and melt-in-your-mouth yeast donut. The Salted Caramel was Brassica's favorite for its simplicity, while Brocco prefered the Bourbon Vanilla, which was the most traditional of the four, yet rich in flavor. Brandy's favorite was surprisingly the Honey Glazed, which was more of a cake like donut that had been cut in half and filled with a delicious cream. To balance out the decadence of the donuts, Brocco and Brandy ordered a couple of light appetizers. Brocco went with the Shaved Vegetable Salad, which came as a beautiful little bowl with lots of color and texture from the various vegetation, greens, and garlic croutons. Brandy went with the White Polenta, which came with a poached egg, roasted mushrooms, and a goat cheese covered crostini. Brandy was really surprised by this dish, which had a nice salty pop from some capers, a rich earthiness from the mushrooms, and a crunch from a few springs of frisee. "I don't really even know what to call something like this," Brandy mused, spooning through the fluffy polenta, which really just served as a blank canvas for the rest of the ingredients to play upon, "A hash perhaps? A melange?" "How about 'a bowl of food?'" Brocco suggested, enthusiastically. "'A bowl of delicious food!'" Brassica piped in. "Yes... I was thinking perhaps something a little more descriptive, but well done," Brandy said. For her entree, Brassica chose the Smothered Biscuit, which came with crispy onions, fried eggs, and harissa sausage. "Its plated quite beautifully, isn't it?" Brassica said, studying the dish with a large magnifying glass she had pulled out of her pocket, "Such an organic design! See Professor Binto? This is the kind of disbursement we need for the matrix interface in order for it to operate less mechanically!" Brandy was utterly baffled by this revelation, but Brocco seemed to find it intriguing. After making careful study of her plate, Brassica finally dove into the dish with gusto. She reported the biscuit to be heavy and filling, but in a very satisfying sort of way, balanced nicely by the rich gravy, which had just the right amount of spicy kick to it. Brocco had gone with the BBQ Pork Biscuit Sandwich, but since he has become a strict vegetarian ever since designing an abattoir that was just a little too efficient, he substituted the meat for a a vegetarian sausage patty. Brocoo really loved the punch from the jalapeno aioli matched with the sharp, creamy cheddar cheese, the fresh greens, and the beautifully fried egg. "I do wish I could experience this sandwich in its intended glory, though," he sighed, "But I made a promise to the porcine community and I'm sticking to it." Brandy also went with a biscuit sandwich, but hers was served with a fried chicken cutlet. Brandy found it a little difficult to eat the tender, buttery sandwich with her hands, as it crumbled quite a bit with each bite. The chicken itself was amazingly juicy and a triumph on its own, but when combined with a little wilted kale and pork sausage gravy, it made for a truly satisfying, rustic flavor combination. Brandy was also rather delighted by the side that came with the sandwich, namely the thin and crispy homemade potato chips, which had a brilliant smokey spice to them, and the sweet house made pickle slices. "I don't usually care much for pickles," Brandy said, studying one of the emerald colored circlettes, "But these I would gladly put on almost any sandwich." Several coffee drinks, two appetizers, three entrees, and approximately two donuts each (Brandy demanded a few more to take home with her) only averaged each person about $35 after tax and tip, which Brandy thought was quite an impressive value for such high quality food. The service too had been extremely friendly and attentive, especially impressive when one considers how crowded the restaurant got. Just as Brandy had planned, Brocco seemed to be flooded with new ideas as they made their way to the front. "What about a bicycle helmet that dispenses donuts straight into your mouth while you are riding? Or a travel mug split internally in two so that you could have coffee in one side and tea in the other?" he was excitedly relating to Brassica, who was doing her best to put on her gloves at the same time as writing everything down. In their hurry to record Brocco's torrent of inspiration, they actually lost track of Brandy, but soon collected her when they realized she'd gone back inside to order more donuts. Postcards from Bunny: Pret A Manger 5 Grain Oatmeal + GIVEAWAY!!! If you've been a fan of Bunny and Brandy for a while now, you might have noticed that their culinary choices rarely have anything to do with the healthiest options. Generally, when you get to Bunny and Brandy's age, the more bacon, butter, and/or bourbon a dish is laced with, the more likely it is to get ordered. But that's not to say that Bunny and Brandy are opposed to healthy dishes. "If it tastes good and its made to the finest standards, I couldn't give a flying monkey's what it's fat or calorie count is, nor if its gluten free, sugar free, caffeine free, sodium free, or hydrogen dioxide free," Brandy says. So it was with great skepticism that Brandy read in one of Bunny's postcards (sent from the very tip of Argentina) that she was going to start making an effort at eating a healthier breakfast each morning. "Traipsing through these ancient burial sights after Benedict is quite trying on me," Bunny wrote, "Its been brought to my attention that a few more nuts, grains, and seeds in my morning routine could help to boost my energy, so I'm giving that a go." "Poppycock," Brandy barked, rolling her eyes at the postcard, "Nuts and seeds. She's not a canary, for goodness sake!" But something about Bunny's words must have stuck with her, because Brandy found herself one morning stuck in the Loop after a snow related train malfunction. With nothing else to do, she decided to seek out a little breakfast at one of her favorite convenience food stops, Pret a Manger. The first things Brandy took notice of were the delectable breakfast croissants in Bacon and Egg and Mozzarella and Tomato, both of which would normally have been the kind of thing she went for: freshly baked, packed with rich flavors, and highly portable. But on this morning, for some unknown reason, Brandy was drawn to another section which housed cup of Pret's freshly prepared oatmeal in two different varieties: the Traditional Steel-Cut Oatmeal and the brand new 5 Grain Oatmeal, which came packed with chia seeds, flax seeds, amaranth, and quinoa in addition to the standard steel cut oats. A variety of toppings were also on offer for both oatmeals, which included cranberries, raisins, granola, cinnamon, brown sugar, and sliced almonds. Intrigued, Brandy decided to sample both the traditional oatmeal and the 5 grain. Much to her surprise (and chagrin) Brandy found herself really loving the 5 grain oatmeal! Its variety of textures just edged out the more traditional oatmeal in her mind (thought the traditional oatmeal was pretty tasty as well), and especially when combined with the sweetness of cranberries and the warm spice of cinnamon the oatmeal provided a brilliant combination of flavors. Brandy was also surprised to find that the oatmeal did indeed provide her with a sustained energy throughout the day as she went about her errands (that is to say her her knitting circle, her quilting society meeting, and the gathering of associated embroiderers). "Maybe there is something to this whole grain thing Bunny was so taken with," she mused, and then quickly promised herself she'd never let Bunny know she might be right about something. Intrigued about Pret A Manger's 5 Grain Oatmeal? Well, you are in luck, dear readers, because Bunny and Brandy are giving away a $25 gift card to one of their loyal fans so they can sample the goods for themselves! The contest begins immediately and will run through midnight Tuesday February 11th with the winner being announced on Wednesday February 12th right here in this very post! The rules are simple: Leave us a comment here on the blog, on our Facebook page, or on our Twitter page simply stating what your favorite topping for oatmeal is! You can comment once through each page and the winner will be decided using Random.org. Feel free to email us at bunnyandbrandy@gmail.com with any questions! Good luck, brunchers! Congratulations to @D_Chehab on winning the $25 gift card to Pret A Manger! Please email us at bunnyandbrandy@gmail.com with your name and address in the next 24 hours to collect your prize!